Published in The Market magazine, 2012. Original article here. 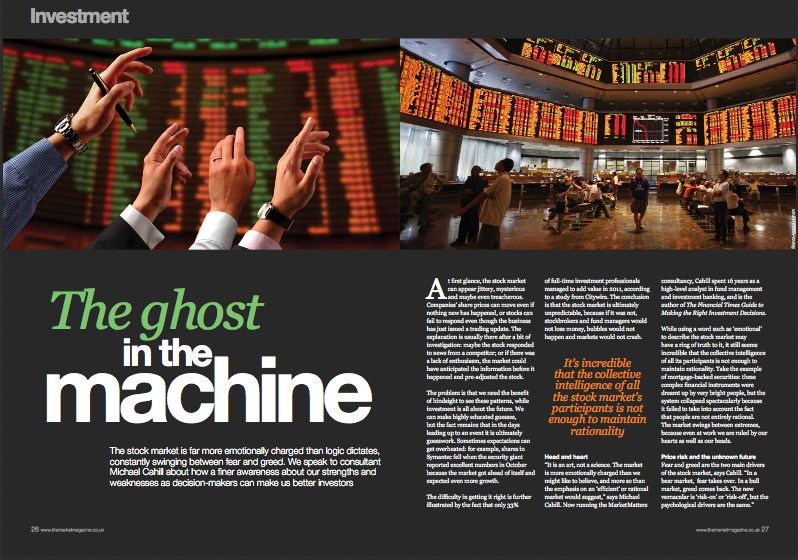 The ghost in the machine: Why is the stockmarket so unpredictable? The stockmarket is far more emotionally charged than logic dictates, constantly swinging between fear and greed. We spoke with consultant Michael Cahill about the psychology of the stockmarket, and how a finer awareness about our strengths and weaknesses as decision-makers can make us better investors. At first glance, the stockmarket can appear jittery, mysterious and maybe even treacherous. Companies’ share prices can move even if nothing new has happened, or stocks can fail to respond even though the business has just issued a trading update. The explanation is usually there after a bit of investigation: maybe the stock responded to news from a competitor, or if there was lack of enthusiasm, the market could have already anticipated the news before it happened and pre-adjusted the stock. The problem is we need the benefit of hindsight to see these patterns, while investment is all about the future. While we can make highly educated guesses, the fact remains that in the days leading up to an event it is ultimately guesswork. Sometimes expectations can get overheated: shares in Symantec fell when the security giant reported excellent numbers in October, because the market got ahead of itself and expected even more growth. The difficulty in getting it right is further illustrated by the fact that only 33% of full-time investment professionals managed to add value in 2011, according to a study from Citywire. The conclusion is that the stockmarket is ultimately unpredictable, because if that was not the case, stockbrokers and fund managers would not lose money, bubbles would not happen and markets would not crash. “It is an art, not a science. The market is far more emotionally charged than we might like to believe. It is far more emotional than what the emphasis on an ‘efficient’ or rational market would suggest,” says Michael Cahill. Now running the MarketMatters consultancy, Cahill spent 16 years as a high-level analyst in fund management and investment banking, and is the author of the book ‘The Financial Times Guide to Making the right investment Decisions’. While using a word such as ‘emotional’ to describe the stockmarket may have a ring of truth to it, it still seems incredible that the collective intelligence of all its participants is not enough to maintain rationality. Take the example of mortgage-backed securities: these complex financial instruments were dreamt up by highly intelligent people, but the system collapsed spectacularly because it failed to take into account the fact that people are not entirely rational. The market swings between extremes, because even at work we are ruled by our hearts as well as heads. Fear and greed are the two main drivers of the stockmarket, says Cahill: “In a bear market, fear takes over. In a bull market, greed comes back. The new vernacular is ‘risk-on’ or ‘risk-off’, but the psychological drivers are the same.” It is this polarity that creates the fluctuations in the market: when things go well, investors are happy to accept risk, but in a downturn our acceptance of risk changes radically. “What we are constantly trying to do is to price risk and the future,” explains Cahill. “But the problem is that the market is uncertain and the future is unknown. If you flip a coin ten times I can tell you the probability of how many times you will get heads or tails, but we still cannot determine the likelihood of Greece defaulting, or a break-up of the Euro. Therefore the shifting appetite for risk and uncertainty over an unknowable future makes for volatile markets.” Or put it this way: it is business as usual at BP, until one day an oil rig explodes in the Gulf of Mexico and 40% is wiped off the company’s value. This is an extreme example, but the point is that the chance of something going wrong is always there, but in a bull market we find this acceptable and in a bear market we do not. The economists tasked with assessing the problem that is Greece can look to similar situations in the past for hints, but this does not provide any guarantees. In addition, the unprecedented levels of government- and individual debts we are currently experiencing is making historical comparisons even trickier. This sums up the challenge for investors in the current market: how to find a company that keeps growing without too much vulnerability. “In order to do this, investors need to pay attention to what really matters: the cash flow,” says Cahill. “But few in the market seem to be taking a long-term view at the moment.” The king of long-term investing is Warren Buffett, who ignores trends, stating: “Our favourite holding period is forever.” What makes Buffett interesting is how he acknowledges that he cannot predict the swings of the market, and instead looks at a company’s fundamentals and cash flow, and makes his decision based on what he believes a business is ultimately worth. Similarly to UK star fund manager Anthony Bolton, Buffett is a contrarian investor. This is one strategy to try and beat the fluctuations of the market, but if it were easy, everyone would do it. Life as a contrarian is lonely and requires mental fortitude; you may have to wait a long time to be proven right and maybe even endure a fair bit of mocking in the process. “Being contrarian is hard, because although we want to believe we are right, ultimately we want to believe together,” says Cahill. The problem with going against the herd is that it is difficult to be sure we are right because of ‘confirmation bias’: we look for evidence to support our assumed conclusion. Cognitive neuroscience specialist Charles Faulkner puts it this way: “Human decision-making works by pattern recognition. We see something we already know, something we already have a mental model of. We make analogies with the mental models we have to gain insights into the new situation to take action.” Here it seems we could learn a thing or two from George Soros, whose investment philosophy is to actively look for evidence he could be wrong. Charles Faulkner leans on psychology to explain why we can be reluctant to take in inconvenient information, but there is also research suggesting a possible physiological cause. The human brain is resistant to recording overly negative experiences, according to a paper published earlier this year in Nature Neuroscience, by researchers from Germany and the Wellcome Trust Centre for Neuroimaging in London: “We found that optimism was related to diminished coding of undesirable information about the future in a region of the frontal cortex that has been identified as being sensitive to negative estimation errors. […] This human propensity toward optimism is facilitated by the brain’s failure to code errors in estimation when those call for pessimistic updates. This failure results in selective updating, which supports unrealistic optimism that is resistant to change.” If this is true, the human animal would actually appear to be programmed for optimism, presumably to ensure we keep going in the face of adversity. This may also explain why we fail to learn from even very recent financial crises. Our ingrained sense of cheer may be good for evolutionary progress, but when it translates into the economy it causes problematic extremes: episodes of wild optimism, which are corrected with periods of deep depression. And the cycle keeps repeating itself: take the accounting scandals of Enron, Worldcom and Parmalat. This happened only ten years ago, meaning we know about the dangers of debt, but somehow we keep neglecting to learn the lesson. Maybe this is because, as Cahill points out, when things go right, we attribute it to skill, but when things go wrong we say we were unlucky. To take emotional and behavioural elements into account for something like the stockmarket, which is technically supposed to be a dispassionate pricing tool, may be controversial. Still, Cahill believes there is an emerging trend of exploring the contribution of the human element to all aspects of economic and political life. Considering the extreme situation we now find ourselves in, a fresh perspective may well be in order. Posted on 01/16/2012 by Jess. This entry was posted in Business features, Technology features. Bookmark the permalink.